Citric Acid, Natural & Artificial Flavor, Sucralose, Calcium Silicate, Silicon Dioxide, Acesulfame Potassium, Fd&C Yellow #5, Fd&C Blue #1. Not intended for use by persons under 18. Do not use if pregnant or nursing. Consult a medical doctor before use if you have been treated for, or diagnosed with any medical condition, or if you are taking a MAOI (Monoamine Oxidase Inhibitor), or using any prescription or over-the-counter drug(s). This product contains caffeine. Caffeine sensitive individuals may experience the following symptoms including (but not limited to) restlessness, tremors, headache, anxiety, palpitations, increased heart rate, or difficulty sleeping. Do not combine with other sources of caffeine. Discontinue use and call a medical doctor if you experience unusual symptoms. Use only as directed. Do not exceed recommended serving under any circumstances. Do not use if packaging has been tampered with. Store in a cool dry place. KEEP OUT OF REACH OF CHILDREN. Maltodextrin, Citric Acid, Natural & Artificial Flavor, Sucralose, Calcium Silicate, Acesulfame Potassium, Silicon Dioxide, Fd&C Yellow #5. ANS Performance has done it again! 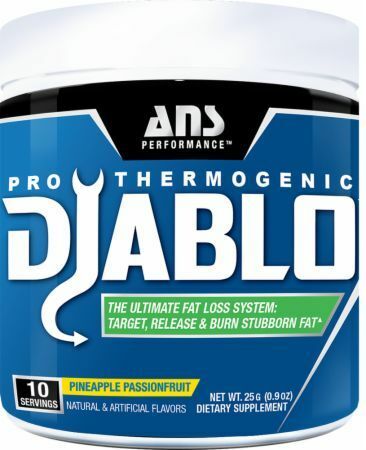 They have released the DIABLO, a heavily anticipated fat burning powder drink mix. This follows their extremely successful pre workout supplement, RITUAL, and allows you to increase your fat-burning potential while you work or work out! 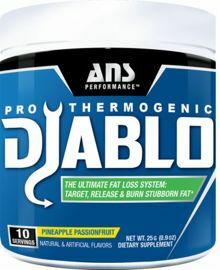 Don't let fat hold your physique hostage, it time to say 'to hell with fat' and destroy it with DIABLO.